It’s tired by now to point out the Herzog-Fitzcarraldo analogy, but it’s foolish to ignore it. “Brian Sweeney Fitzgerald is moving against the Amazon!” The voice of Enrico Caruso is doing battle against the drums of the primitives—and is winning. 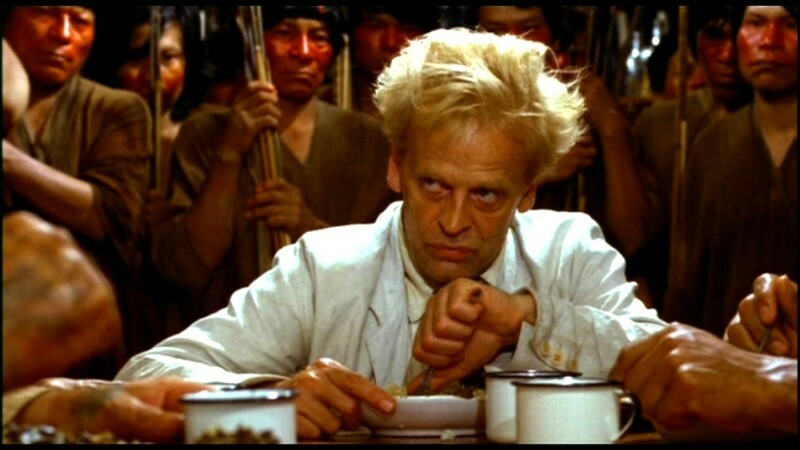 The aesthetic—and profoundly German—presence of Herzog (and Kinski) settles over the Peruvian jungle; Strauss’s Tod und Verklärung both expresses and subdues the power of Nature, as the Molly Aida chugs upriver (a standout of a musical moment, since the rest of the film’s score consists of operatic excerpts with a definite onscreen source, or recycled snippets of Popol Vuh’s music from Herz aus Glas). Nobody can accuse Herzog—or Fitzcarraldo—of being un-self-conscious: “That slope may look insignificant, but it’s going to be my destiny.” What was oblique and mystifying in Auch Zwerge Hatten Kleine Anfangen, Aguirre der Zorn Gottes, Kaspar Hauser, and Herz aus Glas is overpoweringly direct in Fitzcarraldo. Of course Fitzcarraldo’s notion of his own destiny is neatly supplanted by the Indians’; the god who comes with the voice not of cannons but of Caruso is finally less important than his ship; and Les Blank ended up making a better—and better-received—film about the experience than Herzog did. Fitzcarraldo comes around in a circle (so in a sense, the Amazon wins after all), just like the circles that limit Aguirre’s empire of monkeys; only Aguirre, unlike Brian Sweeney Fitzgerald, isn’t laughing. Is Herzog? And if so, is it at himself? The fundamentally comic vision of Fitzcarraldo makes it, to my mind, the definitive Herzog film—which is not the same as saying it’s his best, or even one of his better films. If its Conradian elements—the collision of Old and New World cultures and the notion of the white man who would be god—remain unresolved (in fact, pretty much unexplored) its central opposition is worked out quite satisfactorily: The collisionof Nature with Music becomes an alliance. But Herzog repeats too many of the same Dominion of Nature and Stranger in a Strange Land compositions and camera movements from Aguirre, without justifying them as variations on a theme (in fact, without varying them much at all). It’s stunning to look on and to hear; but finally dramatic and beautiful sights and sounds aren’t enough. 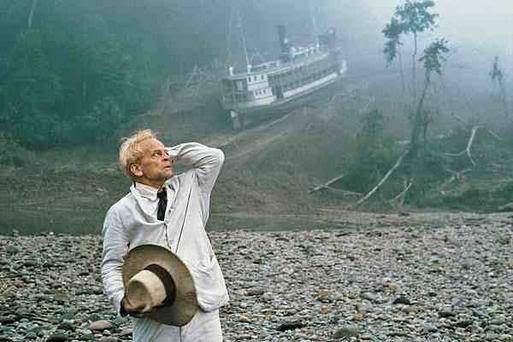 What was done in Aguirre seems overdone in Fitzcarraldo, with no sense of newness of angle or purpose. Do I expect too much? Am I spoiled? Perhaps. But, unfair as it may seem to say so, Herzog himself has set the standard by which his work is to be judged; and most of the time Fitzcarraldo falls short of Parnassus.